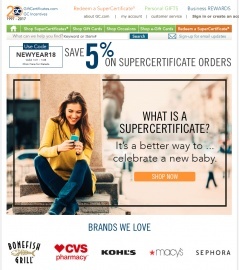 .com for hundreds of original merchant certificates, including national and local retailers, travel services, popular restaurants, and many other choices within the apparel, sports, home, electronics and entertainment categories. Cash Back is not available on Starbucks, Best Buy, Lowe's Kohl's, and the Darden Restaurant brands which include Olive Garden, Bahama Breeze, Red Lobster and Longhorn Steakhouse gift cards, Business Rewards purchases, B2B purchase, SuperCertificates redemption, MasterCard, Visa, & American Express gift cards. Click a Coupon or click Start Shopping to earn 2% Cash Back at GiftCertificates.com.